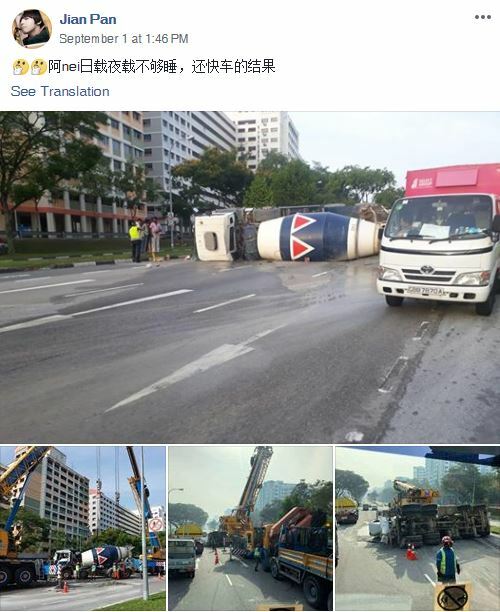 A cement mixer truck flipped onto its side along Woodlands Avenue 9 at about 5.20am on Saturday (Sep 1). A Stomper, who was driving past the area, said: "I'm not sure what happened to the truck. "I was curious as to why the traffic was slow on the weekend. Stomper Wongu also alerted Stomp to photos of the accident that was posted online by Facebook user Jian Pan, with accompanying photos showing two cranes attempting to lift the overturned truck. In response to a Stomp query, the police said that they were alerted to an accident involving a cement mixer truck along Woodlands Avenue 9 towards Woodlands Avenue 10 at 5.28am. The driver, a 34-year-old man, was conscious when conveyed to Khoo Teck Puat Hospital.